One note on the pimiento pieces – we usually use one whole roasted red pepper and that’s a fine substitution. We often buy a big jar of roasted red peppers and freeze them, though right now we’re still going through a stash of red peppers from our CSA. We got a bunch of them at the end of the season and roasted them. Then we laid them out on a cookie sheet and froze them, then put them in a freezer bag once they were frozen. We use this spread on sandwiches or in burritos or even in baked pasta but most frequently it gets sandwiched between two tortillas and then fried in a pan in a scant bit of canola oil or Earth Balance. 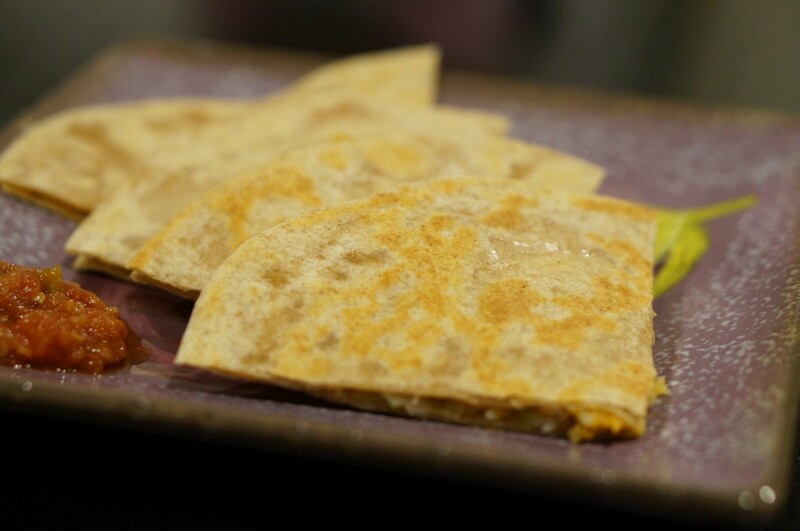 We’ve found that the kid will eat almost anything that’s included in one of these quesadillas. 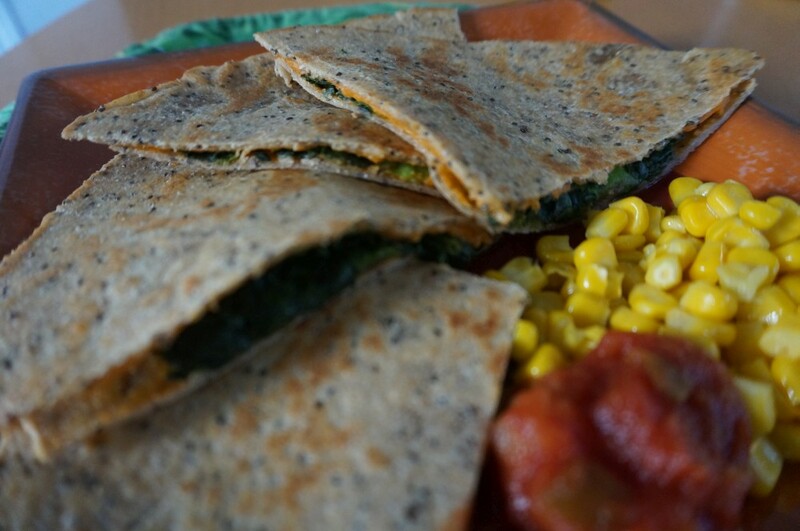 If we’re in a rush and/or don’t have anything else in the fridge, we might just add some frozen chopped spinach (just sprinkle it on frozen and it’ll thaw while cooking the quesadilla). What’s pictured below included some sauteed cabbage and leftover pureed sweet potatoes but anything we have handy and that’s nutritious is fair game: mashed beans, finely diced seitan, cooked greens, broccoli, avocado, etc. These can be part of a larger meal but often they’re a quick weeknight meal by themselves. If we’ve got a bit of salsa to put on the side so much the better. I should also note that if you can find the time to make your own tortillas I highly recommend it. Since this is often a quick meal we usually use store-bought tortillas but we make our own on occasion. The trouble with most name-brand tortillas you find in mainstream grocery stores is that they’re filled with preservatives and other un-pronounceable ingredients. When we do buy ready-made tortillas we generally get them from Whole Foods or Trader Joe’s and the store brand in either place has a much smaller ingredient list. But when you make them at home you can make them with nothing more than flour, water, salt and a little oil. We do like the recipe from Terry Hope Romero’s Viva Vegan, which includes the addition of chia seeds, a nice touch. Here’s a previous iteration with homemade tortillas.